This is my 8th outing with famed director Akira Kurosawa and will certainly not be my last. Nor close to my last. Wasn’t my first either. It was my 8th. That number doesn’t seem nearly high enough to properly emphasize how enamored I am with this man’s work, in particular the way he manages to make his constant collaborations with Japanese greats, Mifune, Shimura, and Nakadai, seem completely unique and lacking in even the slightest redundancy of their previous efforts. 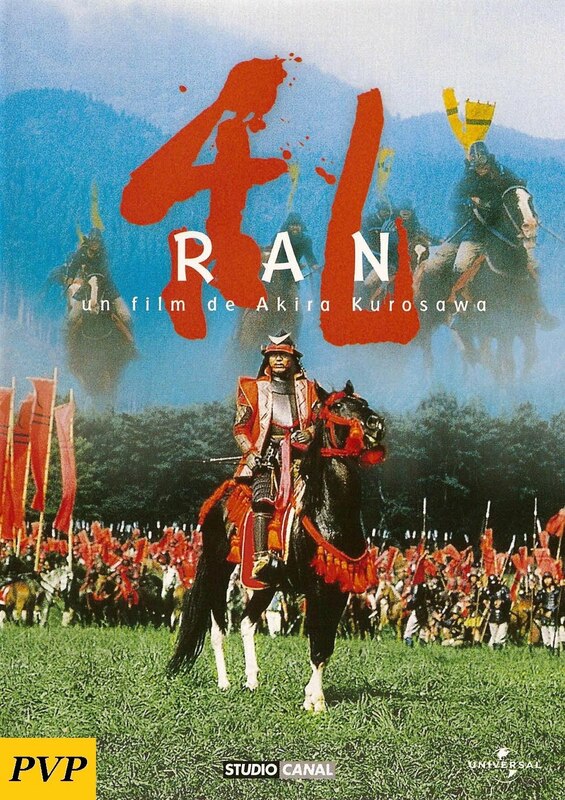 This feat alone is a testament of Kurosawa’s talent behind the camera as many of these feature similar content and genres like the famed Samurai/Period epic that his name has become synonymous with. So what of this film “Ran”, which means revolt in Japanese and is pronounced like “Ron” for us not from Japan? Does it contain elements of Kurosawa’s pension for dramatic structural alterations which shatter conventional plotting, as he did with the last half of “Ikiru” and “High and Low”, shifting focus and tone so thoroughly yet without batting a single eye? Not really… But sorta… I guess… But not really. In many ways, this is Kurosawa’s swan song and his last “big” film. I use the word “big” because few films are as epic as this one but it, despite coming so late in his career (he died less than a decade later), is also often heralded as not just one of his best but his best. So, with that in mind, this film may not mess with convention with as much audacity as previous works, but it is very much new territory for the director; new, dark, and tragic territory. The film positively seethes with depression and melancholy. Much of this could likely be attributed to Kurosawa’s state of mind after failing to secure financing for several of his films as well as his wife’s passing during filming (to which the man only took ONE day to mourn then returned to filming). Never has a film so much felt like a bitter reflection of an artist’s state in life since Chaplin’s “Limelight”. The story is largely inspired by Shakespeare’s “King Lear” and because I am an uncultured plebeian I am relatively unfamiliar with it. However, in keeping with my preconceived notions on the Bard’s work, it seems a majority of aforementioned melancholy could be ascribed from the source, though what I’ve read, Kurosawa did not always intend for this film to take such direct inspiration from the play. Thus, the summary of the plot is this: An aged Warlord (king) is betrayed two of his sons… And then life goes downhill. It is the little moments that will undue you. The film is rife with reflection as it gradually unfolds the past of these characters. Former betrayals boil to the surface, insecurities proke, and no one will be able to come away from this tale of greed and murder unscathed because they are inextricably linked to events and actions that transpired even before this film began. Despite the story beginning in that fortuitous moment after a hunt, it could have begun years before. The film can most be likened to a rolling boulder. We may have begun watching just before it hurtles off the cliff, but we are left with the inescapable sense that it has been rolling long before we started watching. This feeling of fatalism is persistent throughout and is one of the films greatest strengths and imbues every single scene with a sense of purpose. It is rare to see a film that can bolster a run time this long and not feel long in the tooth, but the movie is never lacking in gripping you with another twist of the plot, character development, or theme building. Whether it is the horrified Hidetora slipping into madness, an extraordinarily violent battle or the vengeful Lady Kaede gradually unveiling her true agenda, the film is never at a loss for something to say. Mentioning Kaede and Hidetora brings us to the necessity of mentioning the performances. Mifune is often celebrated for his ability to become any character Kurosawa could throw at him, but far too often Tatsuya Nakadai is forgotten and that is a crime against cinema. This is the man that played two dramatically different villains in both Yojimbo and Sanjuro, so different from one another that many often fail to realize it’s even the same man. Here, Nakadai plays a man that is at least 20 years older than he was at the time and dons extensive make up to gain the appearance of a man that is both ghoulish and wraithlike. It is a positively striking demonstration of his talent as he can effortlessly float between intimidating, pitiable, sympathetic, to positively creepy. However, the character and performance that grabbed my attention the most is Lady Kaede. She is the wife of his oldest son, daughter of a former enemy that Hidetora had crushed decades ago, and one of the most manipulative, spiteful, and merciless characters ever put to film. It is a testament to Mieko Harada’s talent that, while playing a character that could easily be a caricature of evil, embues Kaede with a sense of humanity and pain that makes her sympathetic as yet another victim in this sordid tale, where those wrapped up in it can become so contorted by the pain thrust upon them that they too can become monsters (or in Hidetora’s case, how monsters can become victims, a reflexivity prominent in this film). The film almost doesn’t bear mentioning in regards to the technical virtuosity on display. Kurosawa is a craftsman of such obsessive attention to detail that only Kubrick can compare and even then, may be overshadowed by him. The cinematography ironically uses vibrant reds, blues, and yellows to contrast this dark story. It positively dazzles visually whether it be the elaborate sets and suits of armor or the recurring motif of moving clouds, which emphasize the aforementioned “rolling” nature of the story. The violence is perhaps the most disturbing he’s ever done, with the too red splashes of blood soaking the screen from the pin cushioned soldiers. It’s just an extremely well made film. My only complaint with the film is the inclusion of the jester-esque character (who has no historical bearing and is the most obvious lift from Shakespeare) Kyoami. This character’s flamboyant, opera styled songs and mockery quickly wear out their welcome in the first half and come to a head about an hour and 40 mins into the film when he garishly ruins a profoundly sad scene of Hidetora picking flowers. Of all the characters that are mercilessly crushed and killed during this film, why couldn’t he be one? So then, if I have done nothing but praised this film in this review (save for Kyoami, which in context isn’t that big of an issue, he got better towards the end of the movie), why then do I not consider it his best film? The answer is simple: His other films are just that great. Also… I don’t even know what my favorite film of his would be. Is it the poignancy and life affirming proclamation of the difference one man can make that makes Ikiru his best? Or is it the complex thriller plot that shifts from the moral quandary over the responsibility a mogul has over the life of his driver’s son to one of the greatest procedurals of all time in High and Low? Maybe it’s how positively awesome and badass Yojimbo is to where just it’s bombastic score can put a gigantic grin on my face? The answer is unclear. Perhaps Ran will enter the fold but who knows? If you haven’t seen this movie, change that.